The Structures Section is the technical focal point for all mechanical aspects related to antennas, including reflector, dipole and phased array antennas. This includes also towers and feed support assemblies, as well as whole top-floor modules, support structures and deployable structures. The field of activity includes definition of requirements and interfaces to the spacecraft and the multidisciplinary interrelation to the thermal, AOCS and electrical sub-systems. Specific domains of expertise represented in the Structures Section comprise classical FE analysis (linear and non-linear) thermo-elasticity, kinematics, vibro-acoustics, thermal control interaction with the structure, composite materials and manufacturing processes. Various related technology developments responding to the ever more complex mission requirements are being carried forward within the Structures Section or have been finalised recently. 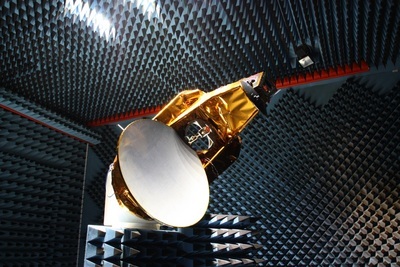 The main products involve ultra-stable antennas, dual-gridded antennas, light-weight structures, deployable antennas, composite materials for RF applications, manufacturing processes, but also system-level activities related to the identification of the driving design requirements and the specification of the interfaces, model philosophy and the verification approaches.